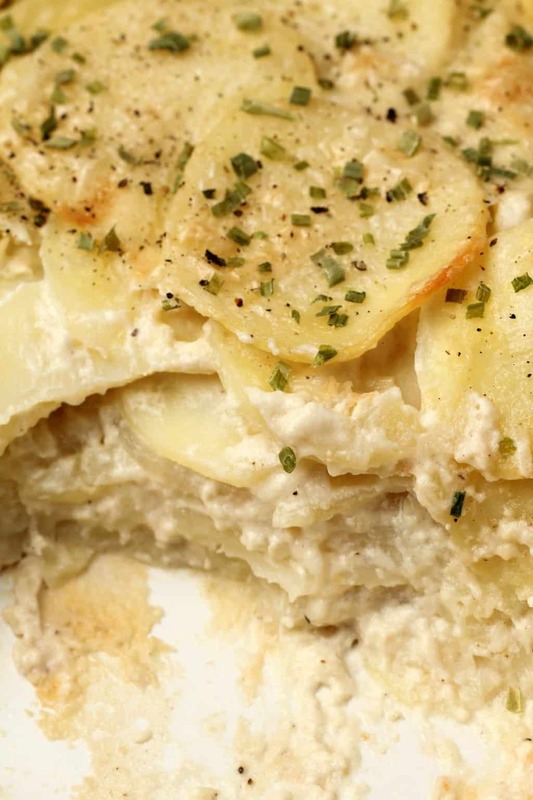 Creamy and ultimately delicious vegan scalloped potatoes. 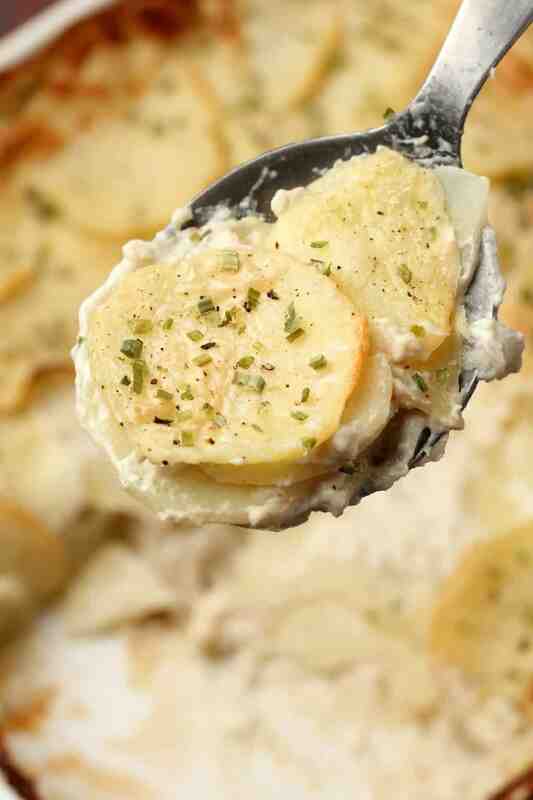 These are the perfect side dish for a special occasion. 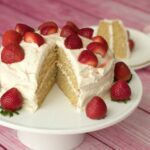 A simple recipe with spectacular results! 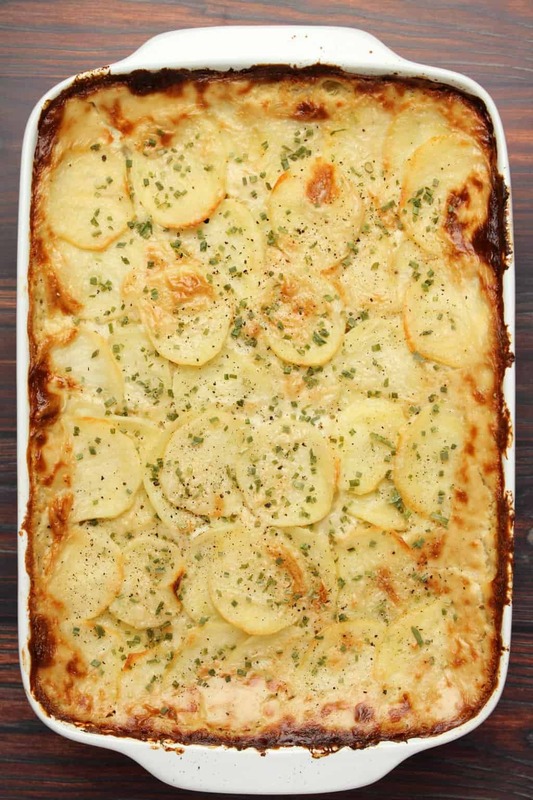 I hereby present…vegan scalloped potatoes. And I present it very formally because I have to make a fuss somehow. Getting this recipe right was one of the biggest struggles of the year. Okay, not really, small exaggeration there. But we did make this approximately 12 times. It might’ve even been more. 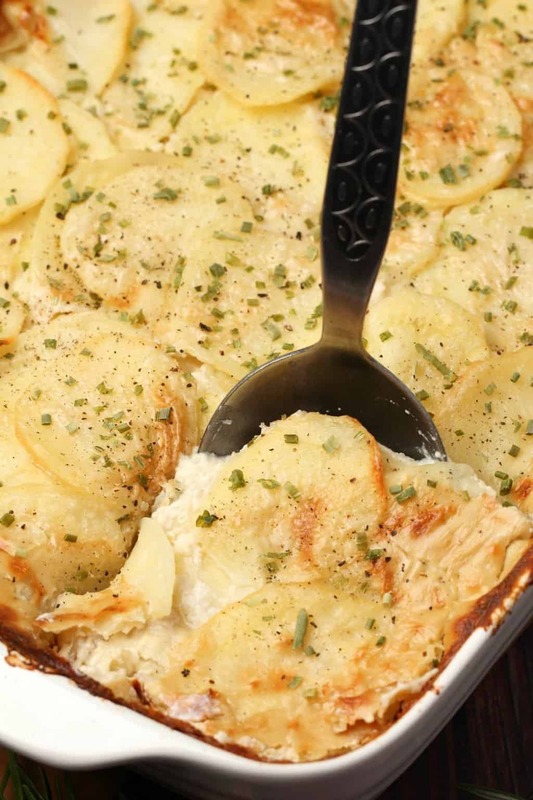 We ate so much scalloped potatoes the past few weeks we pretty much overdosed on them! The plan was to get this recipe to you before Thanksgiving. And well… that didn’t happen. Then we kept trying and trying because I thought well lets at least get it out before Christmas! I nearly despaired at one point and told Jaye we would have to circle back to this one and maybe get it out before Easter! I mean, it’s a perfect side dish for a special occasion. And thank heck we finally, finally got it right. 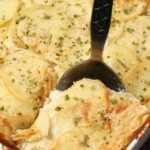 Making these vegan scalloped potatoes also gave me some lessons in cooking, things I had never heard of before were learned in this process. Things like: it’s possible for a white sauce to ‘break’ when baking. Have you ever heard of such a thing? I hadn’t! Not until I literally saw it in action. That was with a previous incarnation of this recipe when I was trying it with a bechamel style sauce. I pulled it out the oven after an hour and all looked good, but the potatoes were still too hard, so I put it back in for half an hour, and pulled it out only to see what a sauce ‘breaking’ actually looks like. It looks like the oil and the starch of the sauce literally break apart. You have oil and then you have starchy bits. It’s really pretty gross! I shelved the idea of the bechamel sauce but since we’re talking cooking tips and I brought up the breaking of the sauce story, let me just tell you that I found out that the way to avoid this is to not bring your bechamel sauce to the boil before you use it in a dish that is going to be baked for a loooong time. Shorter baking periods don’t seem to have any impact. I’ve used bechamel sauce in a lot of baked dishes like vegan lasagna and in a vegan pasta bake with no issues. But if you’re going to be baking something for a long time (more than an hour), this is something that can happen. So then I switched to what ended up being the perfect recipe, which is a cashew based creamy sauce that is made in the blender. 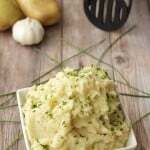 You just add all the ingredients to the blender jug, give it a quick blend, pour it over the layers of thinly sliced potatoes and onions and bake it. Simple. Except….I just could NOT for love or money get it to look good for the photos. It all tasted amazing, but it was either too browned, or not browned enough, or it would brown unevenly and look all splotchy. We tried putting cheese on top, and, thanks vegan cheese (that I could get at the time), all that did was make it look like a thin layer of plastic on top. Every attempt tasted like heaven, so we were not going to give up, but eventually we settled on the perfect amount of potatoes vs sauce and covering with foil vs baking uncovered to get something that looks as good as it tastes. And this is it! Slice the potatoes (and onion) evenly and thinly. This helps them to cook evenly, and a little faster, though, let me not lie, this is not a ‘fast’ recipe, it bakes for a looong time. 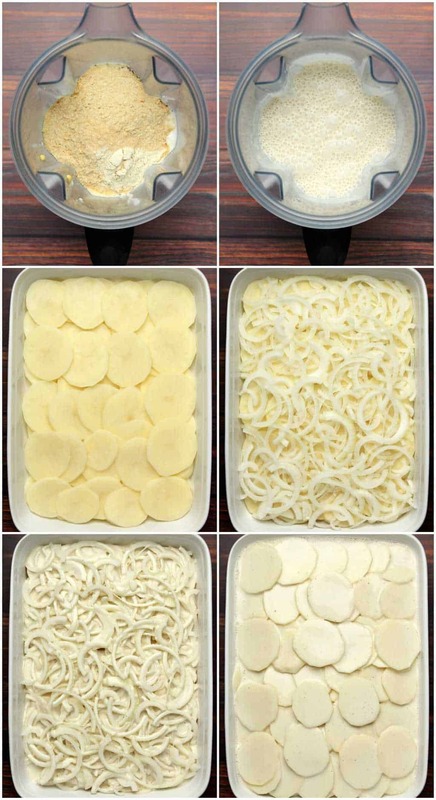 You can either use a mandolin slicer to slice your potatoes very evenly or you can slice them by hand. I definitely can’t do perfectly even, thin slices by hand but Jaye can, so I bring him in on important jobs like this. Use the right amount of potatoes. Usually this wouldn’t be super important in a recipe like this, but as I told you above, getting the ratio even a little bit wrong can have this dish tasting great but not looking as great. You need slightly more potatoes than sauce for the best ‘look’. So weigh your potatoes (peeled weight) to get the right amount. My idea of a ‘medium’ potato may not be the same as yours. If you’re not too fussed by the look of it, then no need to be too precise, you can eyeball it. Every attempt we made at this dish tasted amazing, so I don’t think it’s possible to mess it up too much taste-wise. Blend the sauce very well so that it is completely smooth. It’s a very simple sauce, but you want it to be smooth and completely blended so there is no graininess to it. Bake it long and slow. The magic formula turned out to be baking it at 350°F covered with foil for 75 minutes and then removing the foil and baking it for another 40 minutes uncovered. 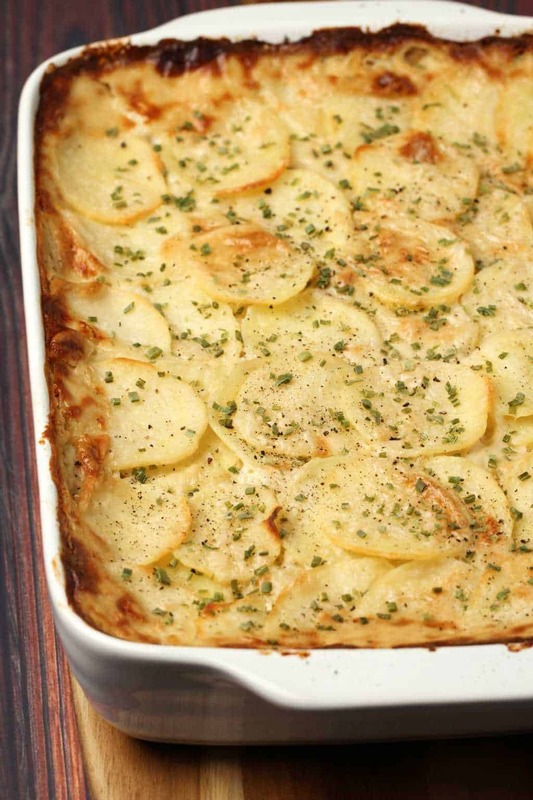 What kind of potatoes are best for vegan scalloped potatoes? Either russet or yukon gold potatoes are going to be great for this if you’re in the USA. If you’re elsewhere in the world, any nice starchy potato that is great for baking is going to work well for this. Can I make this gluten-free? It is already gluten-free, no adjustments needed. 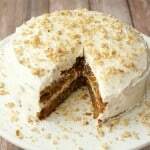 I am super excited to make this for my gluten-free mom and sister! Does it taste like coconut from the coconut milk? No, I don’t think it does. 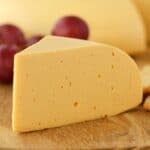 It has more of a ‘cheesy’ creamy type of flavor and texture. I do recommend you use full fat coconut milk from the can, as that is what is going to produce the best results for this recipe. Can I make this ahead of time? Yes! You can make this in advance. The best way to do it is to hold back about 1/2 cup of sauce. Bake covered in foil for the 75 minutes as usual, but then remove from the oven and leave the foil on while it cools. When it’s cooled, remove the foil and add the remaining 1/2 cup of sauce, spreading it evenly. Cover with foil again and place into the fridge. When you’re ready, preheat the oven, and reheat it with the foil on for 20 minutes (just to get to the same point we would be in if we never chilled it), and then remove the foil and bake it for the 40 minutes uncovered (as per the recipe). Leftovers keep very well covered in the fridge. I should know, we had so many leftovers from the roughly 1 million recipe tests! Leftovers will stay good for at least 3 days and likely more. 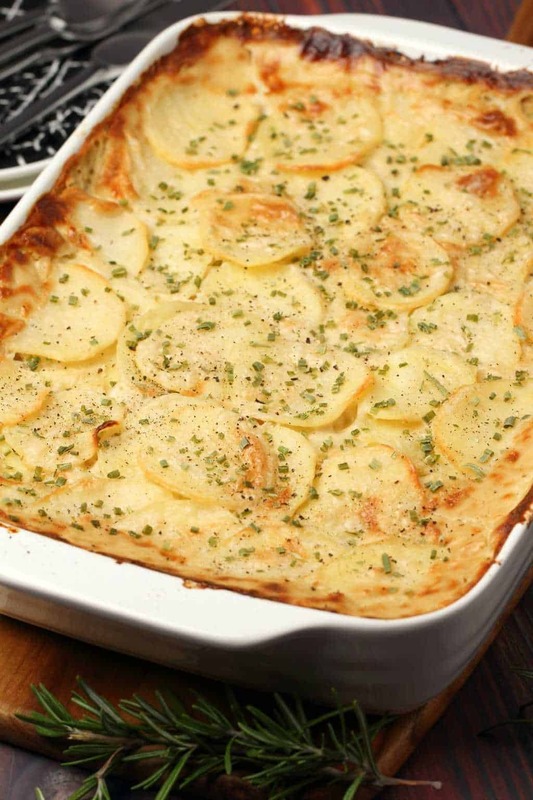 Let us know what you think of these vegan scalloped potatoes in the comments and please rate the recipe too! Thank you. Sign up to our email list as well before you go, we’ll send you an awesome (and free) recipe ebook with 10 delicious vegan dinner recipes and you’ll be the first to know when new recipes are posted to the blog. 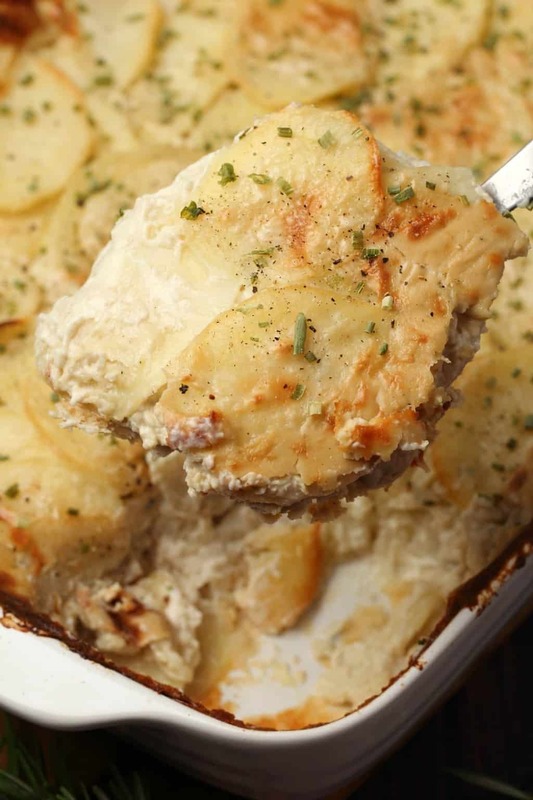 Creamy and ultimately delicious vegan scalloped potatoes. These are the perfect side dish for a special occasion. 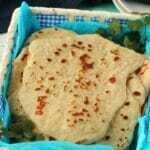 A simple recipe with spectacular results! Gluten-Free. Add all the ingredients for the sauce to the blender jug and blend until very smooth. Set aside. Peel the potatoes and weigh them to get the peeled weight. Slice them finely using either a mandolin slicer or by hand, aiming to slice them thinly and evenly. 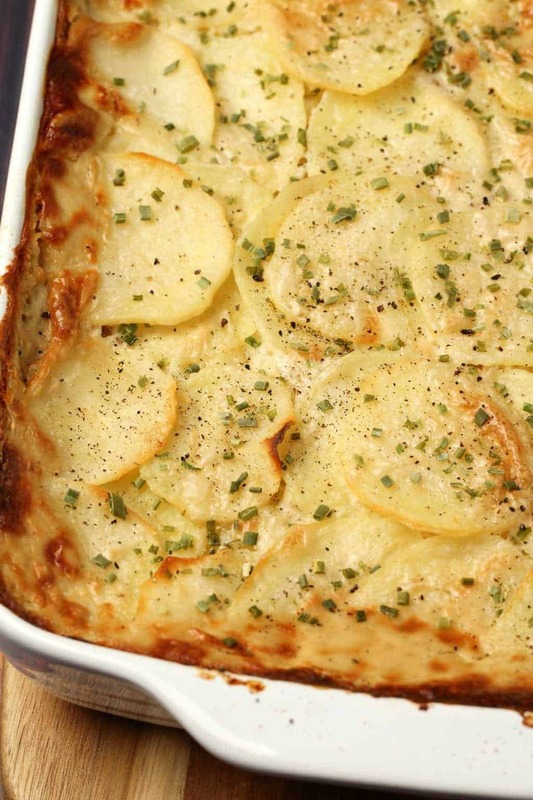 Layer half the potatoes in a 9×13 oven safe dish* and then add all the onion in a layer on top of the potatoes. Pour over half of the sauce (~500ml). Then layer the rest of the potatoes over the top. Pour over the remaining sauce. Cover with foil and place into the oven to bake for 75 minutes. After 75 minutes remove the foil and return to the oven to bake for a further 40 minutes. Allow to cool for 10 minutes, sprinkle with chopped chives and serve. *It’s not essential that you weigh the potatoes, you can also eyeball it and have it be a little more or less, but the ideal ratio of potatoes to sauce is going to result in the best ‘look’ for this dish. But no matter what, it’s going to taste great! *Spray your baking dish with non-stick spray if you think there is any chance of it sticking. The dish I use never sticks so I didn’t use it, but you may need to. Oh my gosh! This is seriously so good! A definite for Christmas. Yummy and delicious. I need a bite. 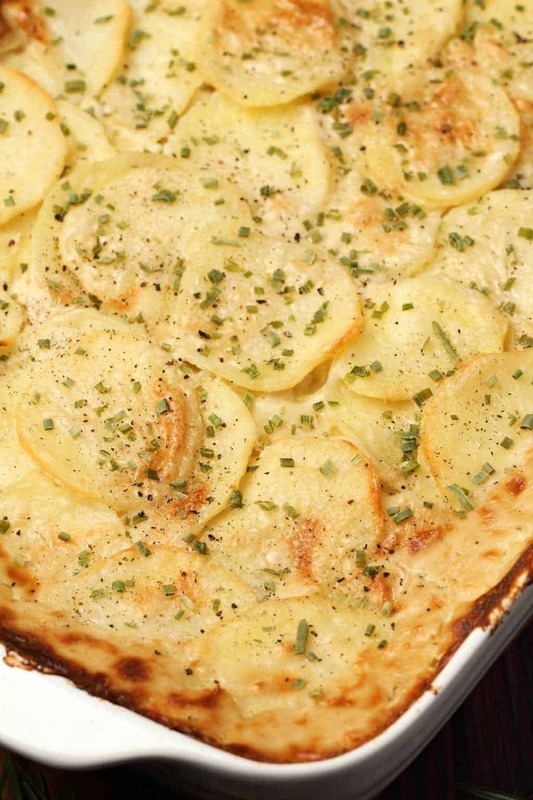 I never managed to make a truly great scalloped potato dish before but I sure can now! 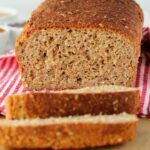 This recipe is the bomb! I am so excited about it, this is definitely a keeper! Wow, this is amazingly good! It makes enough to feed 12 people, too. I followed the recipe exactly, weighing out the Yukon Gold potatoes and using a mandoline to slice them thinly, as recommended (though I did then fail to weigh the other ingredients)… This dish has a sweet taste from the coconut milk and my non-vegan husband says it tastes like tarragon to him. Just delicious. Thank you for sharing. I’m thinking of slightly modifying this tonight. Instead of using cashews, because they are way too pricey where I live, I’m going to try either white lima beans or cannelloni beans. Also, using a different type of milk (boyfriend crazy picky about coconut) and maybe adding some vegan cheese. I’ve been trying for so long to find a good sub for cashews with no luck, and read once that certain white beans can do the trick. Here’s hoping! Oh interesting! Let us know how it turns out. 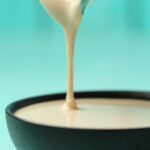 I’ve had success making a good vegan cheese sauce using soaked raw almonds. 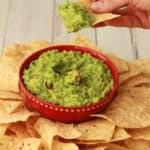 They aren’t as rich as cashews would be, but I think it would work pretty well in this recipe. When reviewing the recipe I noticed that no soaking of the cashews is required. They do blend smooth enough in the recipe? I plan on making this for a lunch sharing where we do humanitarian work on Weds. it looks delicious my hubby and I are plant based. Thanks for sharing. Hi! Yes they do blend smooth enough, there is a lot of liquid that you are blending these with so definitely no need for pre-soaking, but just let it blend for a bit to make sure it’s nice and smooth. 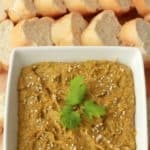 Hi, I love your vegan recipes and want to make this dish to take to a dinner party tomorrow. Can you recommend an alternative to cashew nuts as someone attending is allergic to nuts. Thank you in advance. Not to worry and thank you for sharing. Mind blowingly delicious!! Thank you! Even the non-vegan loved it! Hi Carol, sorry to hear that it stuck! I didn’t grease my dish so didn’t think it would be an issue. I guess different baking dishes might have different results though. Hope it wasn’t too much of an issue! No, I’ll just soak it. I thought I may have missed it in the directions. It’s still absolutely amazing and I can’t wait to make it again when all the non-vegans come home for Easter! 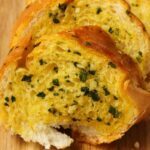 I have literally never made a single comment on the hundreds of recipes that I have found online over the years, but there is no way I couldn’t sing the praises of this amazing dish. It.Is.Everything. Easy to make with non-obscure ingredients. Simply amazing. I can’t wait to make it again…would tomorrow be too soon?